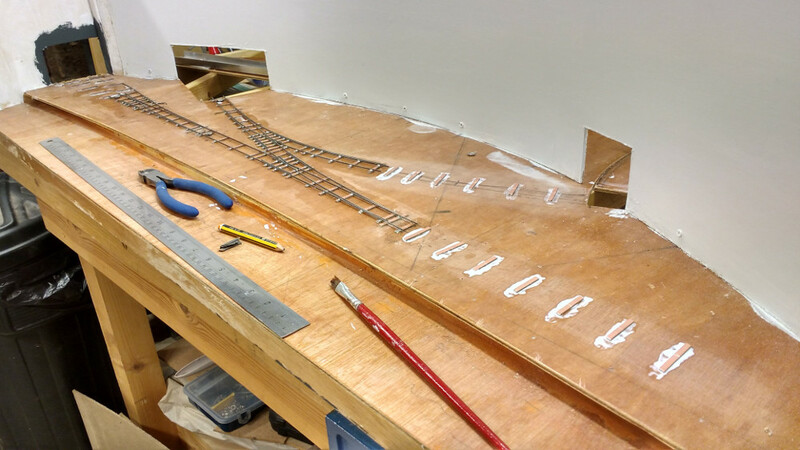 I’ve now completed the trackwork for the scenic side of the layout, and done most of the “backside”. Attached here are some pictures of what I did, and some notes on what I wouldn’t do again! The pointwork for the layout – which accounts for most of the front area – was built off-board, and shown in a previous entry. Here it is lain down on generous bed of PVA (I didn’t bother with any copydex/sound insulation, as the whole lot will be encased in DAS cobbles anyway). Maximum possible weight was applied. I thought this was a good thing. It was not… By putting so much on top of the track (particularly with a broad section of contiboard to ensure a level surface) I managed to create a lovely moist microclimate; which is not good for the steel rail! Much rusting ensued 😦 This was far worse than any rusting I got from the flux. I’ve cleaned off the rust best I can with fine abrasive paper and wire wool. Once wiring is complete, the whole lot will get a spray of primer which should seal things. A little bit more to do on the trackwork at the back and the daughter board sidings — but I’ve run out of rail… On to wiring now (droppers installed along with the track), and them TOUs I keep putting off..
An OO (16.5mm) track gauge modified by filing off a sector of the outer flanges, to allow it to work with aluminium angle. A view along the completed – but “un-setted” dock-front track, gently curved to match the dock wall. 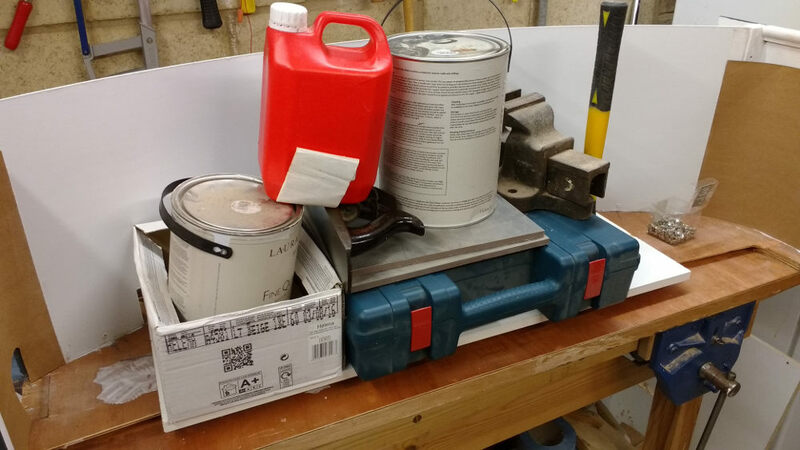 Liberal application of PVA to bond the pre-fabricated pointwork to the baseboard. Gauging the angle aluminium for the sector plates. A joint where I forgot to wash away excess flux with a good scrub with warm water… holy rusty rail tops batman! I’ve been making some good, but slow, progress on trackwork for Junction Dock. 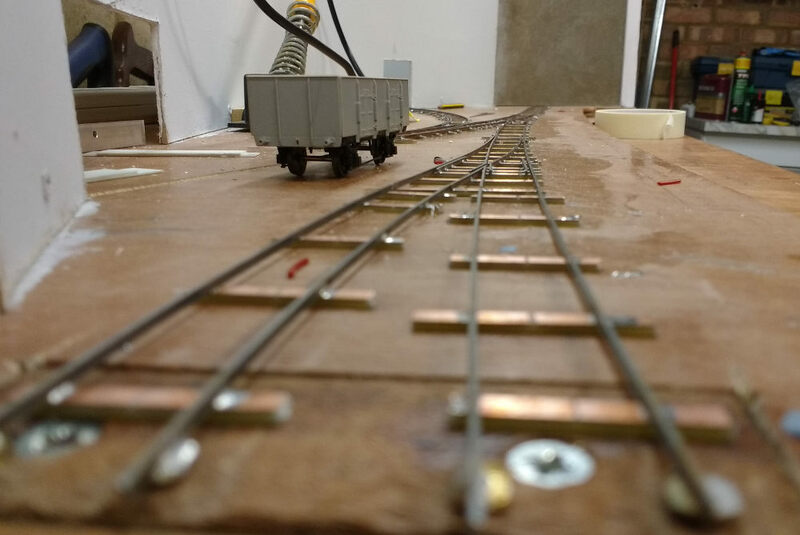 One of the main aims of this layout was to have a go at building trackwork; with the safe assurance that I’ll be able to hide most of the resultant horrors under a thick layer of DAS. I’ve found trackwork threads/posts on various sites incredibly helpful, so I hope me listing my first fumbling steps below might help someone else at some point. This is all PCB construction. The techniques here are pretty much pure Rice (steel rail, powerflow flux + syringe). First step was to get some goodies, which I picked up from Railex back in May last year. 10m of bullhead, PCB, solder, and a set of gauges (OO-SF). What more could you ask for!? I had a crack at building one point, the classic B6L, which didn’t turn out too badly. The gapping is perhaps ‘enthusiastic’, but it actually filled out quite well. I’ve never checked this under power, but wagons seem to run through it OK. As you can probably make out, the set on the turnout road is not enough, and the flange at the crossing is perhaps a tad generous; but fairly happy as a first attempt. Then moved on to laying up the turnouts. PCB sleepers chopped to size (just over size for the track gauge; stingy scot…) and then stuck to a template with thin strips of double-sided taped. 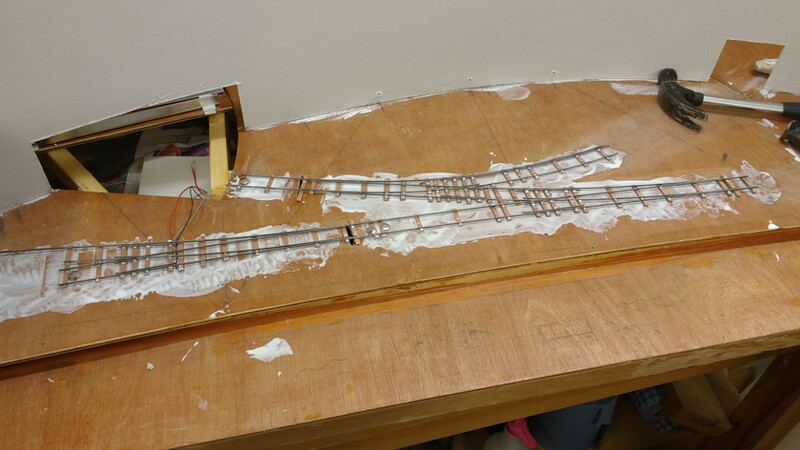 The sleepers were gapped and electrically tested before I started adding any rail. 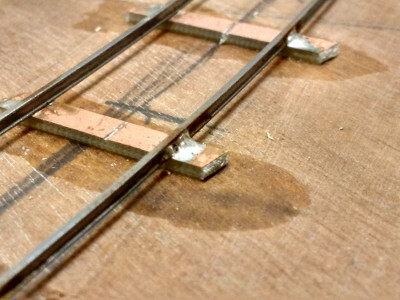 As the track will be inset, I didn’t provide all the sleepers (or make them the right length). I tried to make sure there was one sleeper every 3-4 at least, but in reality the pattern is pretty much set by needing to have a sleeper at the ‘end’ of each distinct bit of rail. Once everything was ready, the switch was soldered up in the order 1) stock rail 2) crossing vee 3) other stock rail 4) wing rails 5) check rails 6) closures + switches (one unit). 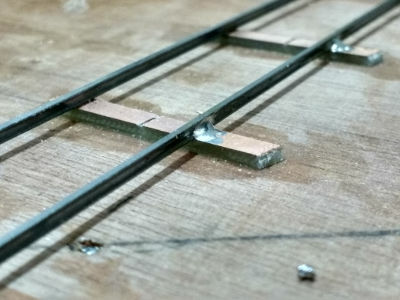 Each piece of rail was mounted in place (with a combination of blutac+template and/or gauges where appropriate), and then soldered up a few sleepers at a time. I used powerflow flux in a syringe (about 0.8mm tip? green needle anyway) to put a tiny (~0.5mm) spot of flux on the outside of the rail. 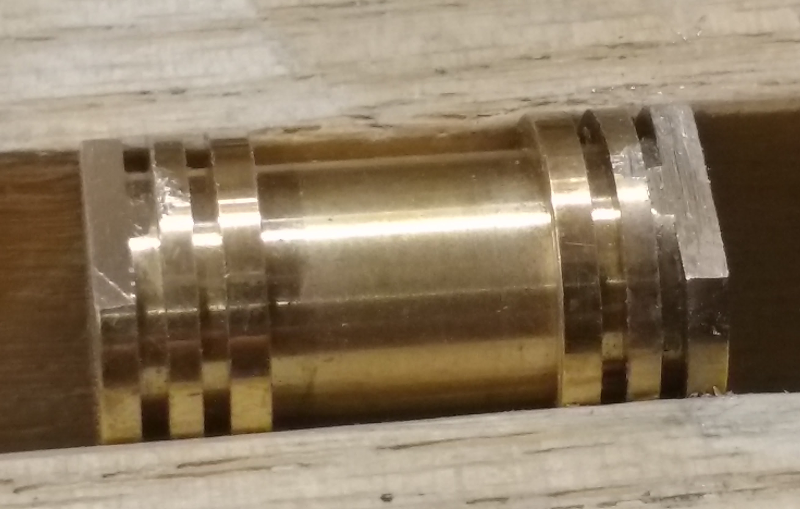 Then picked up a spot of solder (140C) on the iron (Antex 18W) and ‘fizzed’ it onto the joint. 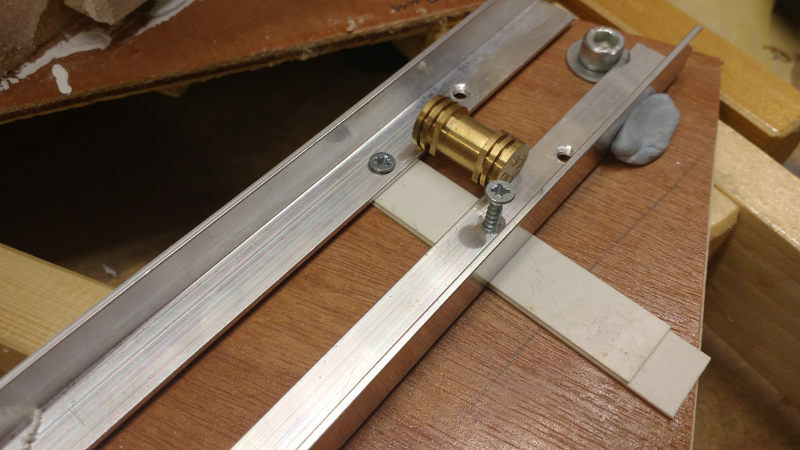 1–2 seconds for the flux to fizz and the solder to flow; quick up-and-away with the iron; and I seemed to get a 95% reliable joint and a chair-ish shape (not that it matters for this track of course). I appreciate this may not be best soldering technique, but it seemed to work for me. Once each whole piece was built, I took it off the paper and gave it a good rinse, scrub (with toothbrush), and dry to get the flux off. This seems like a decent approach, and I haven’t noticed much/any corrison on the later turnouts. I did try to minimise the amount of flux used, with a tiny spot on each joint. I think I used <1ml total for the whole shebang. I did also notice that the flux definitely ‘goes off’ if left in the syringe for any length of time (e.g. week+). Was a frustrating 20 minutes of not managing to solder anything until I worked that one out! Over the space of a month or two, I put together all the P&C I need for Junction Dock. Below shows, my 1st — 4th attempts at track making. I think I got better as I went on, which is always nice. Next job though, before any more track, is to finish off the wood work and get the backscence and proscen(ium) made & fitted.